Happy Friday! Are you feeling into the holiday spirit yet? We have been having a great time sharing Christmas ideas and projects. Sometimes it’s the most random, simplest ideas that I get the biggest kick out of. I was short a tree skirt the other week, but I had a lot of balloons on hand (I always have a lot of balloons on hand). So of course – the obvious happened. 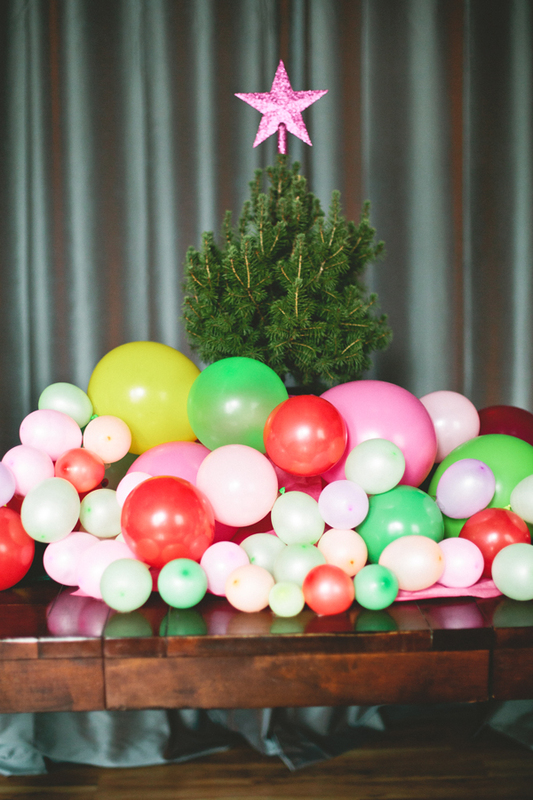 We made a tree skirt out of balloons!!! Now hear me out, this won’t work on your huge family tree that the dog pounces on every night and your kids stomp around almost pulling down. Do yourself a favor and don’t even try it there. BUT for a little tree in a corner that no one messes with, for a small tree to really make a wow moment on your table top, or for a special night when you want your big tree to look amazingly festive and bright. For those times… This tree skirt it perfect! It is bright and colorful and easy peasy to make. All you need is your breath (or a balloon pump), a couple packs of balloons, and packing tape. It is the tree skirt of my dreams. 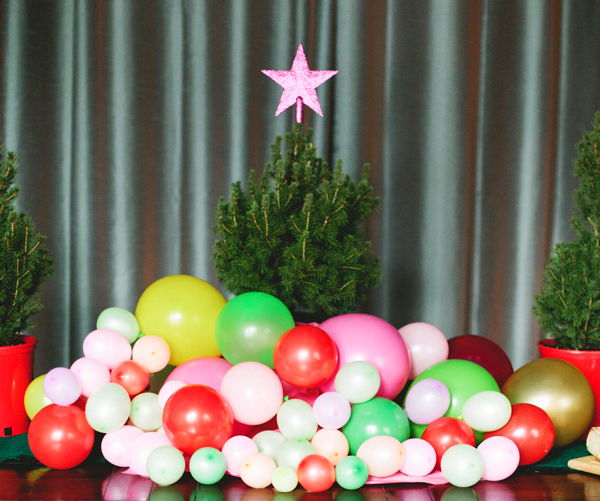 To make a balloon skirt for your tree, blow up all the balloons. I like the texture created by using a series of large and small sizes, and the small ones are great for filling in the gaps. 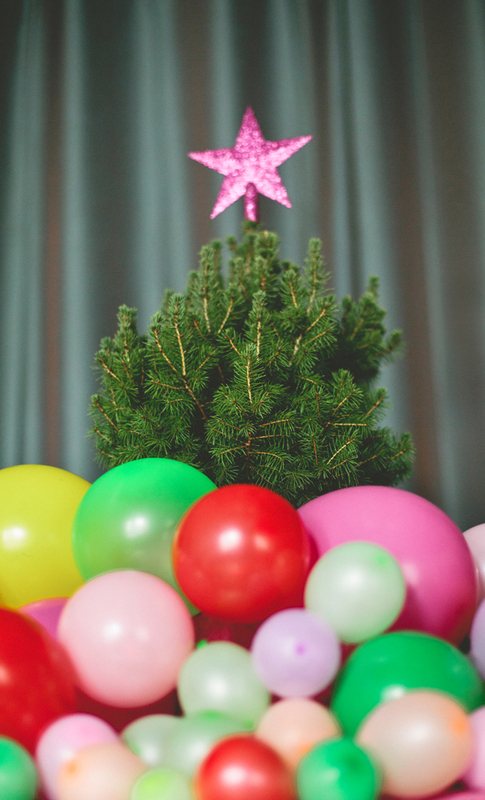 Starting at the base of the tree, use packing tape to adhere the balloons to the tree container, to the table, or to a piece of fabric for a starting space. 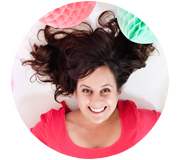 Work down and out from the tree, taping in big and small balloons as you go. PS. Did you see these mistletoe balloons? (Photography © A Subtle Revelry by Jocelyn Noel).